Challenge of Elders features the Grenade Kill Bonus along with Airborne (double damage while you are in the air) and Exposure (much higher Shield HP, but no recharge). As soon as you enter a chamber, just start unloading on a boss with the last bullet of Touch of Malice. If your whole fireteam is doing this, have one person stop at about a third of their health bar so that they can revive the two others when they die to Touch of Malice, and then all can continue as planned. This works great is you want to farm for Three of Coin drops, or if you’re looking for a 335 class item, ghost or special from the rewards screen. Remember to double the points for each Kill / Modifier in the second round, and triple them in the third round. Also note that the points lost from Variks’ impatience are entirely negligible compared to the amount of points you’ll score during the 45 second intervals. First off, Armor: For a Helmet, unless you’re using an Exotic of some kind, I recommend finding one with with Infusion, which replenishes health on Orb pickup. Better Already won’t do much as an alternative unfortunately, due to Exposure heavily penalizing your regeneration. Finally, Innervation wouldn’t be a bad idea either, granting you extra Grenade energy from Orbs – I definitely favor Infusion first, though! On your Arms, you’ll want max Discipline and the Impact Induction perk to get Grenade energy from Melee hits. I also recommend a max Discipline Raid chestpiece to speed up Grenade charge and take advantage of the Mortal Medicine perk which enhances your Recovery for each Grenade kill and stacks for up to 20 seconds – a tiny bit of extra health given Exposure, but it’s the best choice this week. Leg armor doesn’t make much difference, so just look for ammo boosts to support your load-out. Finally, try to use an Artifact that generates Orbs of Light for the appropriate Grenade type. Weapon recommendations this week are much less specific, but remember that Assists are a great way to add up tons of extra points. If you aren’t pumping out grenades every 10 seconds (looking at you, Sunbreakers and (every Warlock Subclass), make sure you’re focused on body-shotting adds to rack up extra points. The best weapons for that purpose are going to be low Impact Hand Cannons, low Impact Scout Rifles, mid-low Rate of Fire Auto Rifles, and Sidearms. Speed-Runs: Use Touch of Malice and just kill the bosses dead, ignoring your own health (make sure one of you stays alive to revive, though. Tethers and Weapons of Light bubbles make this even faster. Now we’re going to break down and rank the best options for each Class and Subclass – you can have success with any Subclass, but some are clearly superior to others. Defenders are just plain an amazing subclass for almost every Challenge, and there’s one glaring reason why: Orb generation. They make Orbs endlessly, repeatedly, and constantly, with almost everything they do. Grenade Kills are a bit of a weakness there, but since Grenade Kills aren’t worth a lot to begin with, you actually don’t lose as much as other classes by getting Melee or Heavy kills, especially if you’re adding in Artifacts or Heavy Weapons that generate additional Orbs – you can almost ignore the objective here and still do well. Plus, everybody loves a bubble, and since your Super regenerates your Grenades energy these days you should be using it every chance you get! Intellect and Discipline are easy choices, and The Armamentarium makes taking advantage of your Bubble Recharge even better. Speed-Runs: This is a top tier choice for Speed-runs thanks to Weapons of Light, especially if you combo with tether. Your goal here is to charge up your Super as fast as possible and then never ever use it. Simmering Flames will have your grenades coming very quickly, so don’t let them pile up. Fleetfire boosts your Agility and Reload Speed when enemies are killed by your fire, which is always nice. Take your pick of Thermite or Incendiary Grenades – the former wrecks spawn and choke points, but the latter’s AoE is awesome for taking down groups and the burn helps ensure kills, too. The Armamentarium’s extra grenade slot makes it an obvious choice for all Titan subclasses, hands down. Finally, I recommend maxing your Intellect to get your super up fast and also maxing out Discipline to ensure maximal recharge speed. Getting that super up is the first thing though, so focus on that. Note on Cauterize: Cauterize gives you health recharge, not health, which means it is severely neutered by Exposure. It will get you a tiny amount of health back, but is objectively a worse choice than Simmering Flames. The Striker’s Pulse Grenade isn’t great for this, but it does offer decent area control which can be useful for locking down spawn points and stacking damage into bosses. The other options just don’t make sense in Prison of Elders. Aftershocks is required, increasing the duration of your Pulse Grenades, and Amplify is mostly to avoid getting inadvertent melee kills. In between Grenades you should be focusing on getting assists with your primary or Sidearm, or pumping Machine Gun rounds into the boss. Overall, not a great choice though. 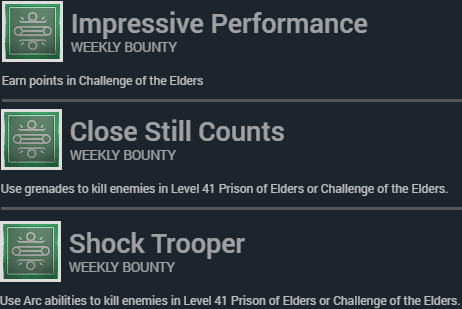 Definitely in the bottom 5 overall Subclasses for this week’s challenge. All you need to know here is to keep throwing Grenades and punch anything that gets close (without killing it). If you insist on understanding the details though – Nothing Manacles is what makes this Subclass arguably your best option for the Grenades Challenge. You not only get a second Scatter Grenade, but your Grenades also get Tracking, enables them to completely shred your enemies with ease. And thanks to Embrace the Void (bolstered by The Hunger), every kill recharges your Grenades that much faster resulting in endless Grenades! Life Steal means your melee not only recharges your Grenades, but also heals you on every hit (not kill! ), which gives you unmatched survivability in the sometimes hectic confines of the Prison. We’ve built an awesome team player here. Your Solar Grenades can litter the landscape with fire, but Fusion Grenades are great for taking down Majors and bosses though. Make that decision, equip the appropriate Exotic, and you’re all set – the perks are the same either way because both Exotics give you a second Grenade and the rest is all gravy. Your main strategy here is clear adds until you can use Radiance in coordination with your teammates to enhance everyone’s recharges via Song of Flame. Radiant Will keeps your super running hot longer, and Solar Wind buys you space from aggressive enemies without burning them out for accidental melee kills. This is easily one of the best choices for this week’s Challenge, especially in terms of team play. Like all of the Warlock subclasses, this one is stupidly good this week. Alchemist’s Raiment gives you stupid potential Grenade energy and makes for a great pairing with a Defender Titan (who should be bleeding Orbs left and right during this week’s Challenge). Unfortunately, the Subclass’s own Grenade Recharge perks will generally result in you getting a lot of subpar Melee Kills and diluting your score a bit – it can’t be helped, and you’ll throw a truckload of grenades to make up for it! As we should all know by now, landing a Throwing Knife Headshot kill stacks the melee and precision kill bonuses to generate the same number of points as a Grenade kill. While getting this is slightly more difficult than just chucking Grenades, you can essentially do it infinitely, which makes this class surprisingly effective. Scavenger also shines here, so long as you remember to fire your weapons every now and then so you can keep picking up ammo – so grab some Assists! Incendiary Grenades are fantastic when it comes to taking down groups of enemies, so those are my first recommendation. Add in Celestial Knighthawk and chuck throw your Super at the boss every time it comes up to trigger the next wave. Tether and Smoke are great for slowing down enemies, and holding them in place to lay on the exploding doom with your Grenades – or collecting Orb / Assist points while your fireteam does the same. Just make sure you’re not using Envenomed on your Smoke – you don’t want accidental Melee kills diluting your score! Lockdown reinforces the slowdown and your AoE grenades, while Black Hole, Snare, and Predator are focused on making sure that your Super and Smoke get used to maximum effect. Oh, and it bears repeating – remember to grab some Assists in between grenades! Speed-Runs: This is a top tier choice for Speed-runs thanks to Tether, especially if you combo with bubble bros. In that case, switch Lockdown to Light of the Pack which will occasionally generate extra orbs if you happen to drop an add that jumps in the way. Bladedancers are pretty poor when it comes to PVE Grenades – let’s just get that out of the way up front. Arcbolts are your best bet, with the chaining damage hitting hard enough to net you some kills and probably a lot of Assists as well. You might think you should throw on the Lucky Raspberry to enhance that chaining, but the real key here is probably getting more Grenade throws rather than simply better ones, so I would use the Tarantella’s recharge buff instead. Statwise, minimize Strength and use the Escape Artist perk to avoid getting unintended melee kills (and unintended deaths). Your main job as a Bladedancer will be to body-shot enemies for Assist points while your fireteam does the killing. This is probably the worst possible Subclass to choose this week, although the Super does score well, adding Melee and Super Kill bonuses, and making some Orbs (4?). Managing Exposure: Remember that you don’t heal with Exposure, so it’s very helpful to die strategically near the end of each wave / round in order to get full shields following a revive. Leaving a few weaker enemies up to finish each of you off in turn makes this easy. Using Airborne: Remember that the damage bonus (x2) applies only while you’re in the air, so if you jump, throw a grenade, and land before it explodes, you’re missing out. You need to throw, then time your jump to be in mid air as the grenade goes off. Shock Trooper encourages the use of Striker, Bladedancer, and Stormcaller. While Stormcaller is great, the other two classes are definitely sub-par, but you may just need to grind it out. If you’re shooting for high scores, maybe use one of those for your weekly Level 41 run – otherwise, you’ll just have to grind out your 45k runs. Bladedancer’s super is much higher scoring than Striker’s, so I’d take it into Challenge and Striker into the Level 41. There you have it – our best advice for dropping bombs in this week’s Challenge of the Elders! Are you using an alternative build? Do you think we missed a key connection? Which Subclass do you think is best? Let us know!